As the days grow shorter and temperatures fall below zero, you know that Christmas is slowly but surely approaching. So, we thought it would be nice to surprise you with two special Christmas packages. If you're looking for a sleek speedster, our Kumpan electric 1953 is just perfect; nimble, dynamic, elegant and technically state-of-the-art. 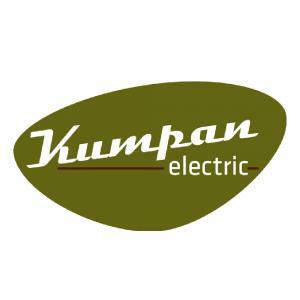 A dream on narrow lanes as well as over main arteries, Kumpan electric 1953 serves best those who love things chic, speedy and streamlined. To complete the package, you will receive everything you need for cruising on your Kumpan 1953; eye-catching whitewall tires, a top-case stash and a carrying strap for easier battery transport. 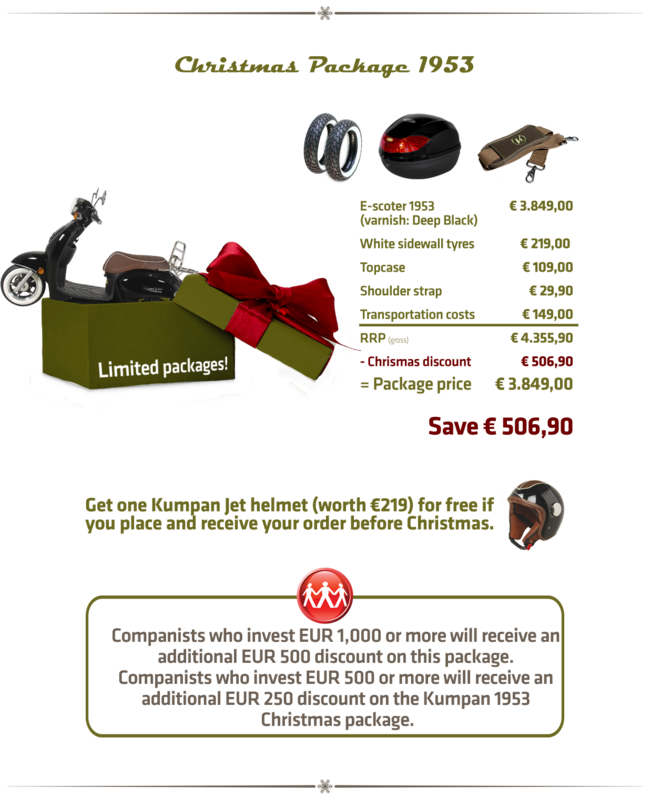 Orders placed before Christmas also receive a Kumpan Retro-Jet helmet. Save as much as €1,225.90. On your quest for the perfect companion to your urban lifestyle, cast your eyes on our 1950 Street model. The youngest member of the Kumpan family combines Retro-Chic with innovative propulsion. Your muscle-power accelerates our foot-bike and its electric motor supports your smooth sailing. 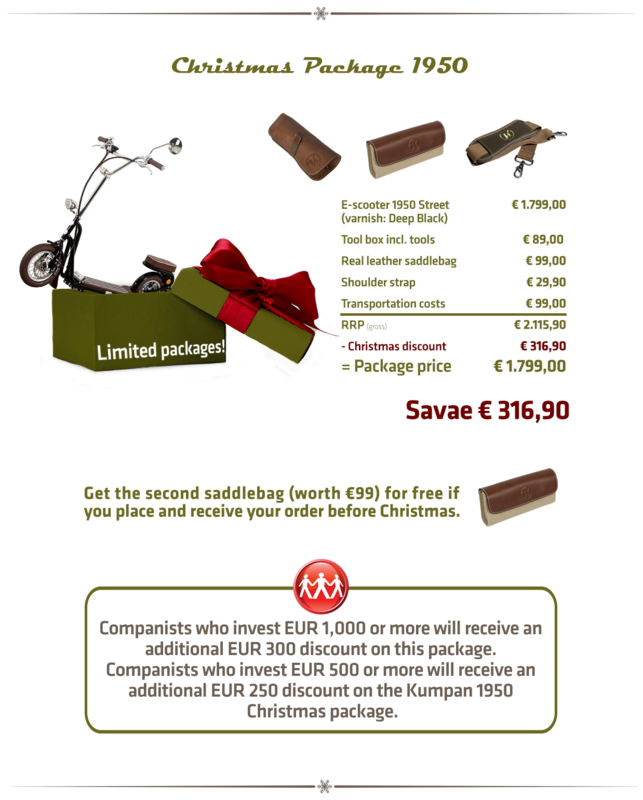 Take advantage of our limited Christmas package 1950 offer, with all accessories for comfortable foot-biking. Save as much as €715,90. These Christmas packages and the separate Companist rebates cannot be combined with other rebate or premium offers. Rebates cannot be redeemed in cash payments. This offer is available exclusively to crowdfunding campaign investments made after November 28, 2016. In January 2017, France will launch an eco-bonus for electric two-wheelers. As much as 25% of the purchase price will be subsidized with a maximum of €1,000. The premium is valid for all two-wheelers under class 125cc. Austria is also kick-starting their e-mobility with an extensive package. A total of 72 million euros will fund varying building blocks. E-two-wheelers are also on the funding menu and purchases will be subsidized with €375. Furthermore, the Austrian e-mobility infrastructure, with charging stations and technical developments are to be intensively supported. Great Britain plans their own funding program, totaling 3.75 million pounds. Buyers will receive up to 20% of the purchase price or a maximum of 1,500 pounds. Within our internationalization strategy for 2017, we are also on the road to additional European markets, revving up and driving our electric revolution further. You and numerous federal funding programs are supporting us on the way. So, let us change the roads of tomorrow together! Invite your friends, acquaintances and business partners to become members of the Kumpan family. Follow us on social network platforms like Facebook, Instagram, YouTube and Twitter. Join the electric revolution!